To facilitate use of my book, PIECES: A YEAR IN POEMS AND QUILTS, in classroom units about quilts and quilting, I have come up with these ideas involving language arts, math, and art. Since I am not current on curriculum components and grade level expectations, I will not attempt to apply these guidelines to the suggested activities. If anyone wants to do so, or develops other curriculum plans using PIECES, I'd be delighted to post them on my webpage, or add a link to yours. Meanwhile, just select and adapt whatever seems appropriate. HarperCollins developed this "Activity Guide" for use with WINTER LIGHTS. Let's Do Math to PIECES! These start easy but they get hard. How far can you go? Make a guess at the answer, then count, add, multiply and subtract to find out. Look at the difference between how much fabric is in each quilt and how much fabric ends up showing. Isn't that amazing? My editor said she didn't believe it even when I showed her the pictures. Want to figure it out? What are the possibilities when you just use lines? What happens when you add color? 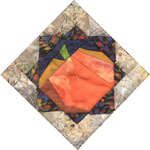 What would you do with all the half-square triangles in the "Pieces" quilt? Symbols of the seasons, individually or together in groups. 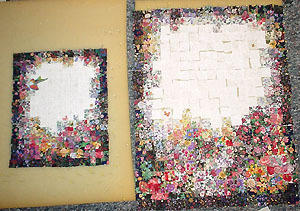 Make a paper class quilt from these quilt blocks. Download GIF files, open in a paint program, and click to fill the colors. Playing with dark and light values. What kind of patterns can you create using dark and light values? What symbolizes the seasons for you? What other symbols can you create? Using all the senses to write about the seasons. Make you own book of poems and "quilts"all about you! Links: Other sites with lesson plans and activities involving quilts and quilting for kids. Things to Do: Lots of writing, art and other ideas adaptable to the classroom, not necessarily quilt related. Quilts, Dolls, and Books: How these tie together in my life. 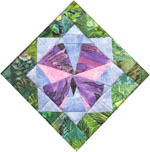 Quilter's Page: Including patterns and links to other quilting pages. Whistling: My second book to be illustrated with fabric! Winter Lights: A Season in Poems and Quilts: Lots of geometry in this new book!